The pioneer families and early settlers of Lake Macquarie, their descendants and details of their lives, based on submissions to the LMFHG, are brought together in this book published in 2006, the 100 year anniversary of Local Government in Lake Macquarie. Beautifully illustrated with many photographs, this A4 sized 432 page soft cover volume is fully indexed and goes well beyond a basic register of pioneer names and genealogies. Price $AUD 40.00 + $15.00 postage and handling within Australia. Please enquire if overseas postage is required. 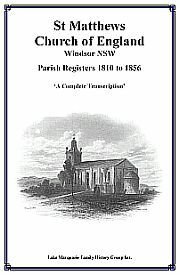 A complete transcription of baptisms, marriages and burials from the parish registers. This A4 sized 370 page soft cover edition was published in 2003. It commences with the first register in 1810 and comprises over 5,000 events and includes a comprehensive index of over 13,000 names (excluding the ministers) detailing everybody mentioned in the registers including the parents, witnesses, employers etc. Introductory content includes a description of the registers, details about the ministers, occupations and places mentioned in the registers with a map and a further reading list. This A4 sized 374 page soft cover edition was published in 2004 and continues on from the first book with 5,140 entries and over 15,000 names in the index. Content includes a description of the registers, details about the ministers and a further reading list. This A4 sized 434 page soft cover edition was published in 2006 and has 5,105 entries comprising 2,726 baptisms, 818 marriages and 1,561 burial entries. The index has 16,782 entries and like previous volumes a description of the registers, details about the ministers and a further reading list is included. This A4 sized 854 page soft cover edition was published in 2009 and is in two parts. The first book of 432 pages contains the introductory text like previous volumes, 4,477 baptism and 1,940 burial entries and an index of these entries and the second book of 422 pages contains 2,209 marriage entries and the marriage index. The remaining stock of the St Matthews books is now only available from the Hawkesbury District Historical Society. 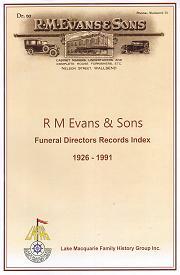 This A4 sized publication of 308 pages published in 2014 contains an index of funerals recorded in the books of R. M. Evans & Sons, Undertakers / Funeral Directors who conducted their business at Wallsend, New South Wales. The index is compiled from twenty one original record books covering the period from 13 June 1926 to 14 June 1991 containing over thirteen thousand records. Some records necessitated more than one entry in the index resulting in an index of 13,722 names. Also included is a biography of the Evans family. Price $AUD 30.00 + $15.00 postage and handling within Australia. This 2003 publication contains, in addition to memorial details, interment details where there is no headstone. Details are in 148 pages with surnames and cross referenced surnames in alphabetical order. The introductory text includes details of the 1898 Dudley Colliery explosion and early settlers of the area and detailed cemetery plans are included. Price $AUD 20.00 + Postage and handling $5.00 within Australia, $10.00 elsewhere. The Group's ABN is 64 732 416 002. For further enquiries, including Direct Deposit details, please contact the group secretary. 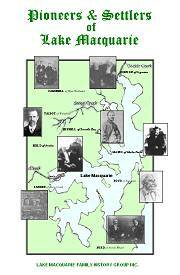 Lake Macquarie Family History Group, Inc. The bookstall at meetings and workshops stocks a variety of resources relevant to family and local history research.